The 32-year-old Ivory Coast midfielder becomes only the third player, after Nigerians Nwankwo Kanu and Jay-Jay Okocha, to receive the honour twice. Football fans voted for Manchester City's Toure, who first won in 2013, ahead of Yacine Brahimi, Pierre-Emerick Aubameyang, Andre Ayew and Sadio Mane. "I am very proud. 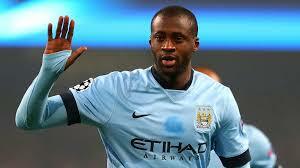 To receive this dedication from the fans is unbelievable," Toure told BBC Sport. "Also I want to pay tribute to the other nominees. African football is growing up, becoming much better and we have fantastic young players coming through now." Toure described all five nominees as "champions". He added: "I am delighted and very happy. And as an African player, I want to lead all my younger brothers to be successful in the future. "When I was a kid I was always dreaming of being an important player. I have sacrificed a lot. "I will continue to try to win a trophy every year, I will fight to win a personal trophy." Two of the beaten nominees have won the award before, Algeria's Brahimi in 2014 and Ghanaian Ayew in 2011. Gabon's Aubameyang was on the shortlist for the third year running, while Senegalese Mane made it for the first time. Toure has been nominated for the award seven times and his second win ensures his year ends with a trophy, just as it began when he led Ivory Coast to glory at the Africa Cup of Nations. He captained the team in Equatorial Guinea and opened the scoring in the semi-final to put his side on course for a 3-1 victory over Democratic Republic of Congo. Toure was a key influence as his country end a 23-year wait for their second Nations Cup title, overcoming Ghana in a penalty shootout in the final. It was Toure's first trophy with the national team in his sixth Nations Cup tournament, and having lost in two finals - in 2006 and 2012. There was less success for Toure with Manchester City, who failed to defend their English Premier League 2014 title and finished second to Chelsea. But Toure remains a powerful presence in the heart of the midfield and contributed seven goals for City in the calendar year. Vera Kwakofi, Current Affairs Editor, BBC Africa, said: "Yaya Toure's leadership for country and club offers an example for many young footballers aspiring to emulate his career. "We are pleased that as the BBC we are here to celebrate and share in this moment with his fans around the world."